3M PCAP Multi-Touch Displays - 42" - 55"
Get fast, accurate touch response and design flexibility from the 3M Multi-touch Controller PX5000 and Proprietary Ultrafine Metal Mesh Design. 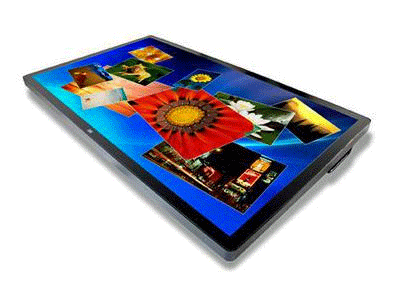 Durable and dependable 3M Multi-touch Projected Capacitive (PCAP) Systems create truly interactive and engaging touchscreen experiences. 3M Multi-Touch Displays deliver a consumer-device look and feel in a proprietary, commercial design. The modern bezel-free, glass-to-edge design and the fully-integrated projected capacitive multi-touch system is delivered in a commercial chassis with all steel construction and strengthened glass that provides durability, dependability and are engineered to withstand 24/7 operation. These displays deliver a sophisticated look and advanced interactive capability. The anti-glare, glass surface enables excellent touch feel to match the industry leading touch performance. Engineered for indoor applications, the displays are suitable for most commercial placements including sunny retail showrooms, conference rooms and digital signage installations. In addition, the displays feature palm rejection to help eliminate false touches and pen and stylus support for flexible input. The displays are compatible with most leading operating systems. Most of the displays are engineered with an active thermal management system that helps keep the touch surface and display components cool in a variety of orientations, even in table-top applications. The strengthened glass provides durability, dependability and safety to withstand the rigors of 24/7 public operation. The display is ideal for multi-user, collaborative and interactive applications, which include in-store assisted selling in retail, interactive digital signage, museums, exhibitions and high traffic areas such as shopping malls, airports, hotels and casinos.